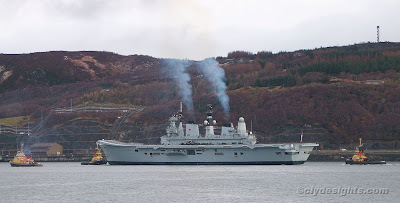 The flagship of the Royal Navy arrived on the Clyde this morning, and ia seen heading past Coulport as she made her way up Loch Long to Glen Mallan. Once she leaves the Clyde, she is due to head for the Orkneys, where she will visit Scapa Flow, before heading for Newcastle. Following these visits, she is due to enter a period of refit at Portsmouth.